What are Causes of Jaw Pain? The temporomandibular joint, commonly referred to as the TMJ, can become dysfunctional in turn creating jaw pain, neck pain, and headaches. Research indicates a close connection between neck pain and TMJ dysfunction. Fifty percent of individuals experiencing neck pain have an underlying jaw dysfunction as the primary source. Certain muscles of the jaw are neurologically integrated in vision, balance, proprioception and postural control of the entire body! When these specific muscles become dominant, they neurologically turn off other important muscle groups. This may lead to forward head posture dysfunction, causing pain in other areas of the head, neck and body. 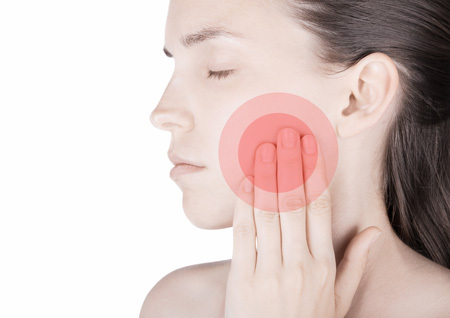 What are Symptoms of Jaw Pain? Common symptoms of TMJ dysfunction include popping and clicking sensations. Often, pain is not present local to the temporomandibular joints. Symptoms will often manifest themselves as headaches, grinding of teeth, and brief episodic electrical type pains. At ICT Muscle & Joint Clinic, we focus on treating the symptoms and root cause of your pain. The body is a dynamic, mobile structure and must be assessed and treated as such to create successful long-term outcomes. We employ the best scientific, evidence-based, treatment procedures using a combination of chiropractic manipulation, soft tissue therapy, and rehabilitative exercises. Surrounding all joints, there must be a balance between tension and compression of the ligaments, muscles, tendons, and fascia; when pain is present, it is due to an imbalance of these structures. This requires mobilization and release of tight structures in addition to strengthening weak or inhibited structures of the painful joint(s) as well as the joint(s) above and the joint(s) below. Jaw pain and dysfunction is often the consequence of improper, neuromuscular dynamics. Our doctors focus on a comprehensive approach, geared toward lasting results.